This course allows you to explore the System Generator tool and to gain the expertise you need to develop advanced, low-cost Digital Signal Processing designs. This intermediate course in implementing DSP functions focuses on learning how to use System Generator for DSP, design implementation tools, and hardware co-simulation verification. Through hands-on exercises, you will implement a design from algorithm concept to hardware verification by using Xilinx FPGA capabilities. * This course focuses on the 7 series architectures. Check with your local Authorized Training Provider for the specifics of the in-class lab board or other customizations. The ZC702 or ZedBoard is required for the “AXI4-Lite Interface Synthesis” lab. Lab 1: Using the Simulink Software – Learn how to use Simulink toolbox blocks and design a system. Understand the effect sampling rate. Lab 3: Signal Routing ‐ Design padding and unpadding logic by using signal routing blocks. Lab 6: Designing a FIR Filter Using the FIR Compiler Block or DAFIR Block – Design a bandpass FIR filter by using the FIR Compiler block to demonstrate increased productivity. 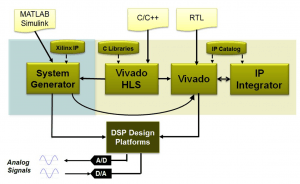 Verify the design through hardware co-simulation by using a Xilinx evaluation board.